I keep telling myself it won’t be long until the sun’s shining so that I have an excuse to buy some new clothes, have a barbeque and sit in the garden sipping a nice cold glass of Pimm’s… well you have to dream don’t you?! At least I finished this machine embroidered picture today, oh and I think this weekend is going to be dry too, hooray! 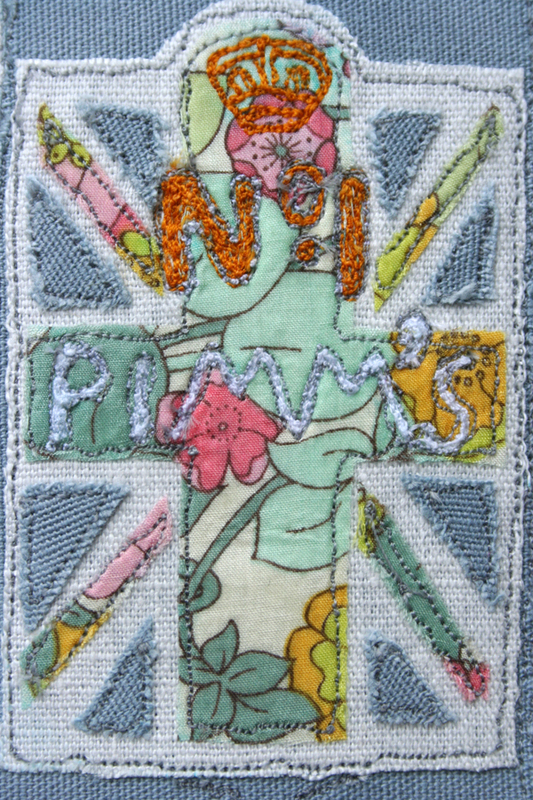 I delved into my fabric scraps bag (which is growing by the day) and decided to use the floral Liberty fabric from my last empire lampshade for the detail on the Pimm’s bottle. It has a really summery feel and I love the colours too. The main stitching on the picture is in a light grey but I added a gold/yellow thread for the writing on the bottle and the crown of course.